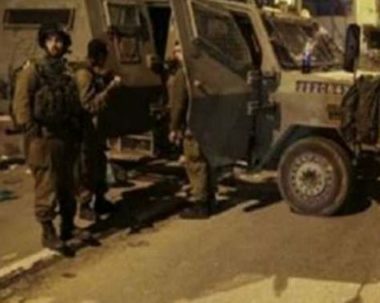 Israeli soldiers abducted, on Wednesday at dawn, three young Palestinian men from Tulkarem governorate in the northern part of the occupied West Bank. Several armored military jeeps invaded Tulkarem city, before the soldiers searched homes and abducted a young man, identified as Ali Odah. The soldiers also invaded Nur Shams refugee camp, east of Tulkarem, and abducted Ezzeddin Abu Dayya, from his home. Furthermore, the soldiers abducted Jihad Shehada, 20, from Tulkarem refugee camp, after stopping him at the Ennab military roadblock, east of Tulkarem. In related news, the soldiers abducted six young Palestinian men in Jenin city, and Jenin refugee camp, in the northern part of the occupied West Bank.